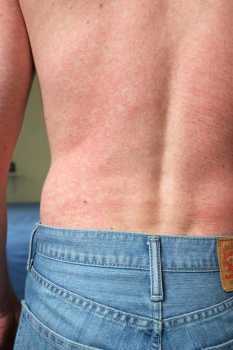 This image depicts a posterior view of a patient’s back, captured in a clinical setting, upon presenting with this blotchy rash. After a diagnostic work-up, it was determined that the rash had been caused by the Zika virus. Response: Zika virus (ZIKV) infection during pregnancy has been identified only recently to cause severe birth defects, including microcephaly, other brain defects, and the congenital Zika syndrome. However, the magnitude of this risk was not clearly defined, with discrepancies between observational data from Brazil and the U.S. Zika Pregnancy Registry. We implemented a cohort study of pregnant women who have been exposed to ZIKV throughout the outbreak that hit the Caribbean in 2016. Zika congenital syndrome abnormalities were more common when ZIKV infection occurred during the first trimester than when it occurred during the second or third trimester of pregnancy. Response: ZIKV should definitely be added to the list of infectious agents that can cause severe birth defects, as are rubella virus, cytomegalovirus, and others. Although defects, and especially the most severe ones, occurred more frequently in fetuses and infants whose mothers had been infected early in pregnancy, some abnormalities were observed in neonates whose mothers had been infected with ZIKV during the third trimeester. Response: Some brain abnormalities may have been missed among babies whose mothers had confirmed infection, because not all fetuses or infants underwent the recommended brain imaging. Continued efforts are needed to increase the proportion of infants who receive thorough evaluation, which is currently ongoing within infant cohorts in the French Territories in America. This entry was posted in Author Interviews, Dermatology, Global Health, NEJM, Zika and tagged birth defects, pregnancy, zika by Marie Benz MD FAAD. Bookmark the permalink.